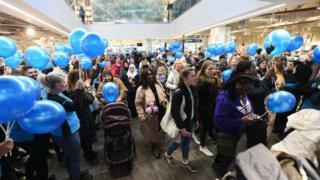 The world's biggest Primark has opened its doors to shoppers in Birmingham. Covering 161,000 sq ft over five floors, it occupies the entire site of a former shopping centre and comes complete with a Disney-themed cafe, a barber's shop and beauty studio, as well as Primark's standard fare - affordable fashion. It sounds like it has redefined the department store in an age when the high street's future is far from certain. So, with big names such as Debenhams and House of Fraser in decline, Primark's vision begs the question - can people be attracted back to bricks and mortar retail? In one way, Primark already has a leg-up when it comes to getting shoppers through the doors, as the retailer has no online presence. About 5,000 people are expected to visit the store at the former Pavilions Shopping Centre on High Street on its opening day. It is four times the size of Primark's old home round the corner. But what happens when opening-day clamour is a memory? How busy will the 430 workers who worked in the previous shop - and their 500 new colleagues - actually be? And if they are rushed off their feet, what lessons could Primark's peers learn? The development is thought to have cost about £70m, an eye-watering sum at a time when high street heavyweights are in peril. Earlier this week, Debenhams was taken over by its lenders as part of an administration process. The allure of Primark, though, continues to grow. And that is despite criticism over staff pay, and the environmental and social impact of so-called "fast fashion". Heiner Evanschitzky, professor of marketing at Aston Business School, said part of Primark's success was its clear business model - which is focused and means "people know what they are going to get". "It is not like Debenhams and M&S, which struggled because they were trying too many different things. They were not positioned in a meaningful way - they have discount elements, high fashion elements and were all over the place," he said. Primark's lack of online presence means shoppers still have to go into stores to make purchases, which can encourage impulse shopping, Mr Evanschitzky added. "In store you have the chance to inspire a customer, you get to say 'look around, browse, think of things you weren't planning on buying'," he said. The new store has snatched the "largest" crown from Manchester and Mr Evanschitzky said its opening would be a "huge gain" for Birmingham city centre. More high street shops close than open every year across Great Britain and the gap is getting wider. Figures from PwC and the Local Data Company show a record net loss of 2,481 stores from the 500 biggest high streets in 2018. These include only "multiple retailers" - those with five or more shops. The number of shops closing stayed at about 16 per day, as it was the year before. However the number of openings has fallen significantly, to about nine per day and almost half what it was five years earlier. Image caption Charmaine Straker said Primark was "an iconic brand"
Mother-of-six Charmaine Straker, 32, from Springhill, queued to enter the store with three of her children - Shae, 12, Xaviel, two, and six-month-old Harmony-Jai. She said: "Stores like this only ever open in places like London. "Because we're the second city and we've got this now, it's like we can finally live up to that title because Primark has become such an iconic brand. "I'm not concerned about prices - if I like it I buy it. But Primark is cost effective if you have growing children." Irene Warrilow, from Great Barr, was also part of the crowd waiting to go into the store. She said: "I like to go into a shop and feel what I'm buying rather than shopping online. "I think the cost of [Primark's] products makes them attractive. "Places like Debenhams and John Lewis are just too expensive." Image caption Michael Higgins believes Primark has "moved with the times"
Michael Higgins, 23, travelled from Herefordshire to visit the new store. He said: "I think it's a novelty at the moment. I'm looking forward to see the cafes and things like that. "I think Primark has moved with the times to cater for different people, whereas other stores and companies maybe haven't so much." A short power cut temporarily brought the store's escalators to a halt earlier and caused lighting to flicker on and off before normal service resumed. "It is anything but," she said. "They are savvy, they know what they are doing. "The easiest way to describe the department shops of old was they were too lazy, they stopped putting the customer and changing demands at the heart of their vision. "They very much took footfall for granted, they always thought if they opened their doors, people would come. "Primark understands what customers want and built their business around it." Ms Hardcastle said expanding "experience retail", with things such as beauticians and beauty bars at value prices, and using links with big name franchises including Disney - and Harry Potter through Warner Brothers - would bring in more customers. And the brand's lack of online presence also made the most of "emotional spending". "When you think of Primark - there is just so much stuff, you go in for one thing and get more and more. Online, you would lose a lot of those purchases," she added. The 29-year-old, from Birmingham, who runs Strangeness and Charm, said: "I know there are a lot of cafes in London which people will visit specifically to take pictures for Instagram, because they have things like flower walls. 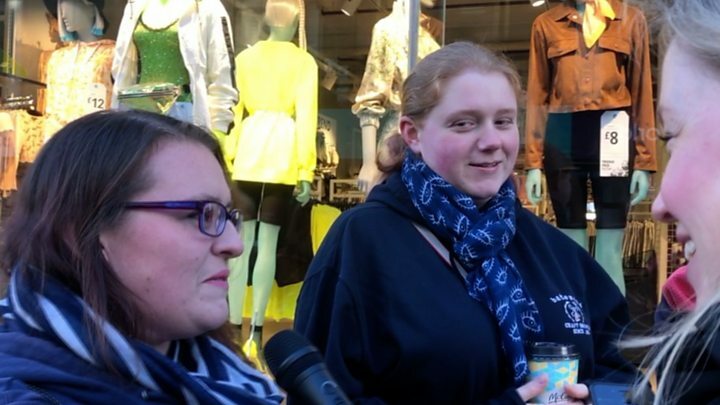 "I know people from down south who have said they want to come up and visit Primark just because of Disney." Claire Cavanagh, 28, from Coventry, who is behind Vanity Claire, added: "Although I wouldn't traditionally think of myself as a department store shopper, Primark is the only shop I go where you do pick up everything in that way. "I think it is a store people will do that for, even those who wouldn't normally physically shop in stores - because you can't get it online. "I think it will be really good for Birmingham as a destination." Ms Cavanagh said that when she was a teenager and student, Primark offered her what she wanted in cheap and fashionable clothes - but she now also used it for homeware. Primark's retail director for the UK and northern Europe, Simon Gibbs, said it was proud to be part of the "fabric" of Birmingham. 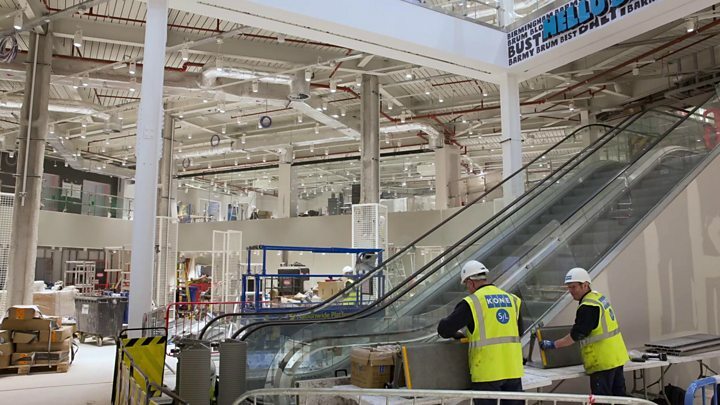 During an advance tour of the centre on Wednesday, Tim Kelly, its director of new business, said: "We have seen the changing face of retail globally and locally. "When we were offered the location we jumped at the chance. "We believe this is an opportunity for Primark to do something really special." The store opened at 10:00 BST on Thursday.